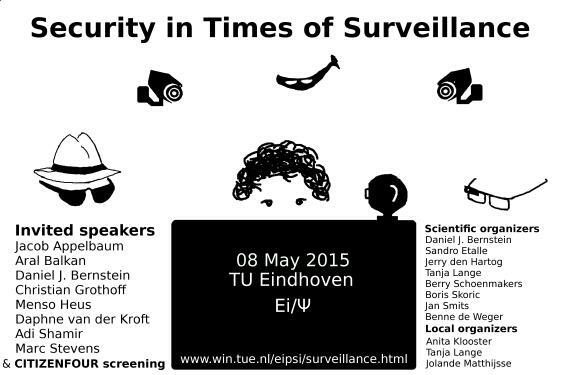 The Eindhoven Institute for the Protection of Systems and Information (Ei/PSI) organizes a 1-day event on Security in Times of Surveillance on Friday, 08 May 2015. The event will take place at the Technische Universiteit Eindhoven in the Blauwe Zaal. It features eight invited talks covering technical as well as legal and political aspects of security and surveillance. The program closes with a viewing of the CITIZENFOUR film. Information of how to reach TU/e is available here. The Blauwe Zaal is at at the center of the Auditorium building, building 13 (in quadrant C4/5) on the campus map. Information such as slides and videos from the 2014 edition of Security in Times of Surveillance can be found at the 2014 page. CITIZENFOUR will come to cinemas in the Netherlands starting 28 May 2015. Also many thanks to Laura Poitras for enabling us to show CITIZENFOUR. Please do not take pictures of anybody without prior consent; per se that means no crowd shots are possible.